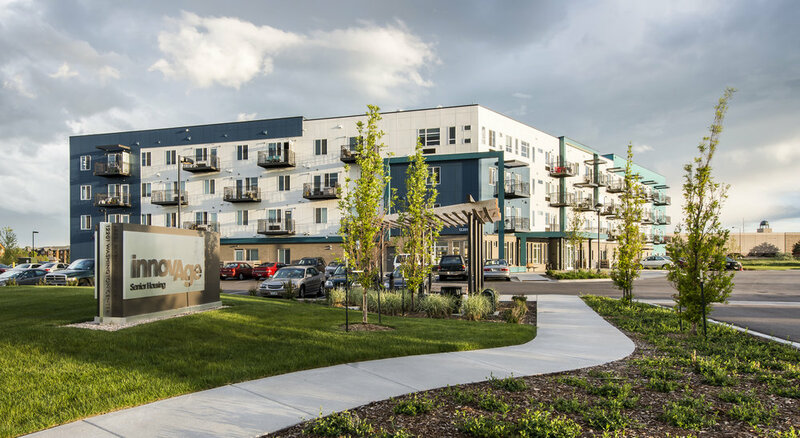 This independent senior housing project in Thornton, CO has been master planned for Innovage in two phases. Phase 1, now completed, sits on an open site next to a regional detention pond and near a large shopping center. Careful consideration was taken for massing, orientation, setting and exterior colors due to prominent location in an open, not-yet-developed parcel of land in Thornton. Building orientation was considered both for maximizing views and future Phase two developments, but needed to be flexible enough to accommodate possible deviation from the final master plan should the owner decide to sell the property. Phase 1 consists of a 4-story building with 73 low to moderate-income senior 1-and 2-bedroom apartments. 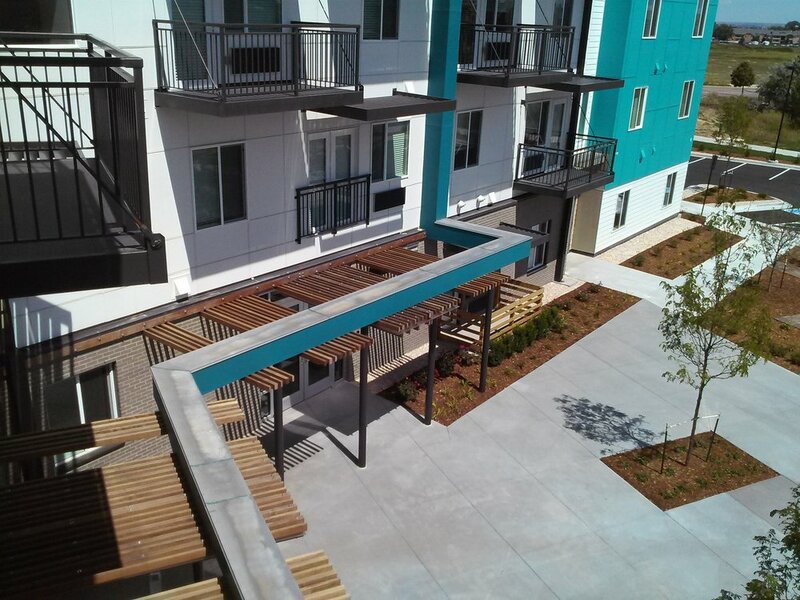 The large site allowed the apartment campus to accommodate many community functions and amenities including extensive landscaping and walking trails. Other amenities include a community room opening directly onto an outdoor amenity plaza, multi-purpose room, theater, billiards room, top level “Sun Garden” room and salon. The building and the future campus incorporate the Heathy Living Initiative and Healthy Development Measurement Tool (HDMT). Building design includes community gardens with community storage and healthy food classes. In addition, a pedestrian walkway encircles the campus nurturing exercise and wellness. The campus also has multi-purpose rooms that can accommodate classes that support physically and mentally active lifestyles.